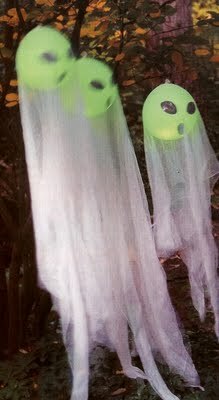 Our plan is to hang them outside of our store’s front door each night now until Halloween. Activate your glow stick first. We will be using glow bracelets. Place the glow stick in the balloon. Inflate and knot the balloon. Position the knot at the top of the balloon. Draw a face on the balloon. Cut a small hole and push the knot through. Secure with a string and hang so they can blow in the wind. The test tonight is learning how long the glow sticks last. Try this at your house and let us know how it goes. Who’s waiting for Starbucks to announce the arrival of Fall with their Pumpkin Spice Latte? While waiting why not whip up some Pumpkin Latte Playdough for your little ones ? It just may become a new autumn classic at your house. Dinosaurs and Octopuses has the recipe for fun this week. Combine the dry ingredients and the oil. Slowly add the water. Add a few dashes of each of the extracts and a few drops of red and yellow food coloring. Cook over medium heat, stirring until stiff. As it mixes you can see if you’ll need more food dye. Adding a little at a time until the desired color is achieved. Turn out onto wax paper. The pumpkin pie spice was too spicy by itself, for my liking. The extracts make it smell sweeter, just like a pumpkin pie. Sniff the dough. Does it smell too spicy? Add a little bit more extract and knead it all together. If the dough is too sticky, add a little more flour. If it’s too dry, add a few drops of water. Betsy, you must give this a try for Oliver. Anyone looking for a copycat Starbucks Pumpkin Latte recipe? Give this one from the Kitchn a try! fun games, prizes, hot cider and treats. Register to win a eco-friendly car! will receive a FREE prize! and take home a “new to you” one. Any left over costumes will be donated to St. Joseph’s Home for Children. 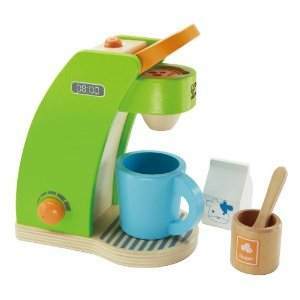 all Melissa & Doug Toys are 20% OFF*. *Not valid on prior purchases, with gift cards or other offers. According to the nonprofit Green Halloween®, families, swapping the costumes of only half of the children who celebrate Halloween would reduce the nation’s annual landfill waste by 6,250 tons, equivalent to the weight of 2,500 mid-size cars. Drop off your swap-able costumes now. In exchange for each complete, clean, gently-worn costume, donors will receive 10% OFF their purchase that day. Perk up and celebrate National Coffee Day 2012! 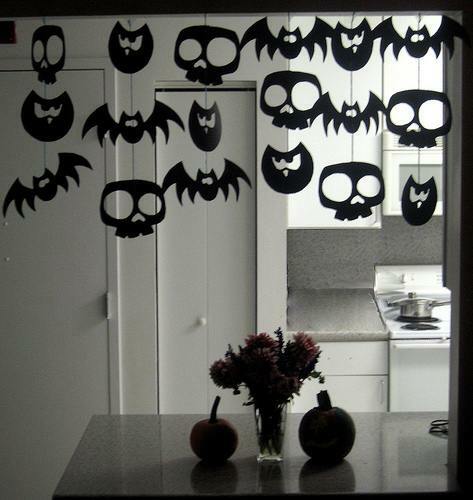 Look at this DIY Halloween Garland idea featured on Forty-Two Roads. We are handing this one over to Erin, our Halloween decorator. Let’s see what see will do with it? Deviled Eggs, always for Halloween, but this year we’re laying (out) special spider eggs to creep out some friends. Bring your Gingerbread Man cookie cutter back to life for Halloween. These Chocolate Skeleton Cookies will disappear before your very eyes, so we suggest doubling this week’s Recipe for Fun. In a large bowl, cream butter and sugars until light and fluffy. Beat in egg and vanilla. Combine the flour, cocoa and baking soda; gradually add to creamed mixture and mix well. Cover and refrigerate for 1-2 hours or until easy to handle. On a lightly floured surface, roll dough to 1/8-in. thickness. Cut with a floured 3-in. gingerbread boy cookie cutter. Place on greased baking sheets. Bake at 375° for 7-8 minutes or until set. Cool for 1 minute before removing from pans to wire racks to cool completely. For icing, in a small bowl, combine confectioners’ sugar and milk until smooth. Cut a small hole in the corner of a resealable plastic bag; fill with icing. Pipe skeleton bones on cookies. Yield: 3 dozen. For a twist, or to “kick” it up a notch, we’re going to make Ninjabread Men Skeleton Cookies this weekend. You can dress Like a Ninja too.